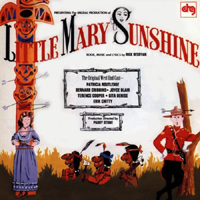 Original London Cast, 1962 (Capitol/DRG) (4 / 5) One of the earliest Off-Broadway musical clicks, Little Mary Sunshine didn’t knock out the Brits when it opened at the Comedy, the small West End theater that’s now known as the Harold Pinter — this so-so reception despite the fact that the sunny-humored title character was played by Patricia Routledge, six years before she came to Manhattan and became the darling of the day in Darling of the Day. As evidenced by the cast recording, there was no attempt by anyone in this Paddy Stone-directed production to veer from native Mayfair accents to sound like Colorado denizens, including Native Americans speaking broken English. (The cliché portrayal of Native Americans would no doubt present a political correctness problem in a contemporary revival stateside.) The London cast sings Rick Besoyan’s score as if it were an opera or an operetta. 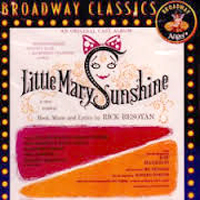 Predictably, Routledge, ever the comedienne, gives a rollicking performance as Mary. The only other familiar name (to some, at least) is Bernard Cribbins. He and all the others, conducted by Philip Mirwell, are pristine in their delivery. Although Besoyan cited American operetta influences for this musical, the English accents here often conjure thoughts of W. S. Gilbert and Sir Arthur Sullivan — the fathers, grandfathers, and now great-great-grandfathers of this whole shebang. — D.F.